Snow Job: Is More Power worth Less Pay? Tony Snow, the conservative commentator and Fox News host, is awaiting a follow-up report from his oncologist before deciding whether to accept an offer to become President Bush’s third White House Press Secretary. Snow, 50, had his colon removed when he was diagnosed with cancer last year. One of his doctors initially approved him to take the grueling job, joking that the post wouldn’t give him cancer, although it might give him heartburn. Comment: All joking aside for the moment, those familiar with the principles and practice of holistic medicine know that lying to others on a continual basis, then repressing the negative feelings one cannot help but experience about such lying, can very well give one cancer, in addition to ulcers and heartburn. Time Magazine: The offer to Snow is a departure for Bush, who has rarely elevated outsiders to top jobs, let alone an outsider who brings his own celebrity and authority. But with his polls at historic lows for an historic length of time, the President has decided to make a few fundamental changes while sticking to his guns in other areas, notably retaining Defense Secretary Donald H. Rumsfeld. Comment: What “fundamental changes” has Bush decided to make? President Bush, like “president” Chen Shui-bian, who is also suffering from low ratings, has defiantly chosen not to make any fundamental changes, only cosmetic changes. If changing the White House’s PR flak is genuinely considered a “fundamental change” by the US major media, then the Fourth Estate and by extension, the nation is in worse trouble than libertarians thought. Comment: Wow. Toss the White House press corps a scrap from the table by appointing a celebrity pundit, “one of theirs” to the job and their hearts are all aflutter. 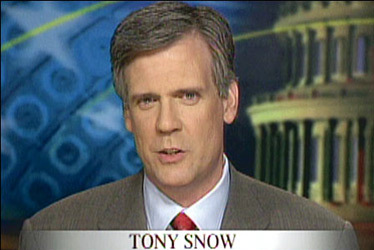 To characterize the job Tony Snow has been offered as a “snow job” is not a cheap shot, but a depressing truth. HL Mencken, where are you when we need you? Time Magazine: Saying he was concerned about the loss of family time and the “massive cut in pay,” [Snow added]: “The up side is that for somebody like me who’s been a pundit for many years, you sit around and you think about the way the world should be, you become part of something that’s very rare, which is an inner White House circle, where you’ve got to make decisions. So there is something that has a sort of perverse attraction, which is it’s a meaty, substantive job with real responsibilities.” The question for Snow, and his doctors, is whether the excitement is worth the hassle. Comment: No, the question for Snow is whether more power is worth less pay. We do not pay sufficient attention to the fact that statists are less interested in either the substance of their specific “problems,” or the merits of their proposed solutions, than in retaining and aggrandizing control over the lives of others. We spend far too much of our time giving credence to statists’ issues by making reasoned or empirical responses to their proposals, and too little time addressing the underlying power ambitions. Merely commenting on government policy for all these years without being able to make government policy was frustrating. Now I’ve got a chance to be part of the “inner White House circle” that issues commands that 290 million Americans must obey. Now that’s what I call a “meaty, substantive job with real responsibilities!” Now that’s got a real “perverse attraction” for me! In fact, it’s got me tingling all over!